the “Decade of Decadence” is here! If worse comes to worse, please send me an Email from your account, and I will either, send you a direct link “Invite” in return, or, I will add you as my friend so you can view all content, but I would warn you there is boring family stuff and a lot of old friends from my previous radio life (over 20 years ago) in Boston Radio area… My current Email address is: Geoffs@kxly.com. About “The Facebook Experiment” coming next…. 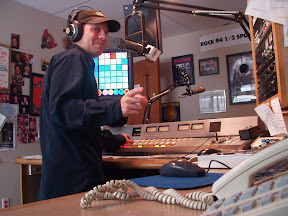 I’ll say it, because nobody else will… but CONGRATS to ROCK 94.5 on a third nomination as ACTIVE ROCK RADIO STATION (med/lg mkt) of the year, and thank you to the RADIO & RECORDS people for taking the time to notice! We aint done yet. Tenth annv coming up next month and they have me squirreled away in the production closet behind the steel curtain piling up all kinds of fond memories and assorted mayhem from our DECADE OF DECADENCE, and I’ve got to get back to working on that now…. for it is late, and I can’t spell for beans at this time of the mornin’ so please don’t spell-check me. On a bright note, congrats to the proud ARMY sargent formally known as our very own Crew-Cheif Mike, and enjoy your R&R while in town- hope we can hook up~! On the other hand, I lost a very dear friend over the weekend in a tragic, almost comical, industrial accident (involving duct tape, and a bubble-wrapping machine). You will be very missed and in our hearts and days. Take care, untill we wrap again.